Raised as ‘good girls’, we are often told that we must know our place, we must stay quiet to ‘avoid trouble’, and of course, that men don’t like ‘too bold’ women. Indian women today are breaking all those norms and stereotypes, by speaking up! This powerful collection of short stories by some of the most promising Indian authors writing on the web today, will show you exactly how. From reimagining of characters from India’s best loved epics to utterly relatable stories set in urban bedrooms, kitchens and offices, these inspiring short stories are highly readable and will have you rooting for their protagonists. 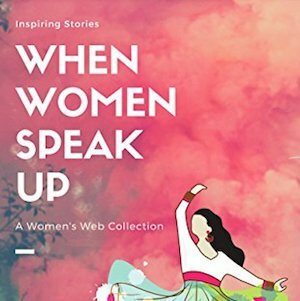 These 19 selected short stories by some of the most talented writers on Women’s Web today capture the angst, the struggle and the joy of women speaking up.